Easter is not complete without cards that express the true meaning of the holiday. In fact, the very fact that we celebrate it as a "holy day" should be enough of a reminder that Easter holds real meaning. This 5x5" card has a cream base. I cut a light green panel and embossed it with the Cuttlebug. Then I sponge-inked the birds in aqua and the leaves in light green. It was THIS treatment that gave me the colour scheme for the card. I loved how the teal-aqua looked under the embossed panel. I created the sentiment using my Gypsy and the font from Quarter Note. Letters are cut from the same cream CS, then outlined with my ProMarkers in Cinnamon and blended. The cross is created from shapes on the George cartridge. 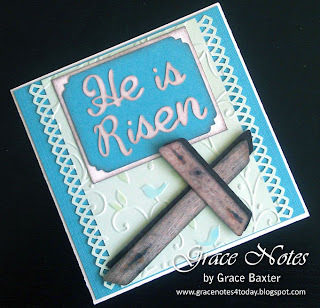 I used woodgrain paper layered over white CS for stability. Then I cut two shadow pieces from dark brown and adhered them together. Notice the markings for on the cross for the spike holes. In placing the cross on the card, I "popped" it with dimensionals. Placing the cross on its side is a reminder that the cross no longer stands. The grave is empty, and He is Risen! Hallelujah.